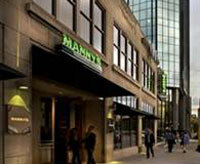 Manny's Minneapolis has Moved! Join us at the W Hotel at the Foshay. Masculine, bright, accented with wood & leather, Manny's evokes the great steakhouses of New York & Chicago - & eclipses them in critical & popular acclaim. Rated Top Five in the U.S. by the Zagat Guide, named one of America's top Steakhouses by both the Knife & Fork Club & the Independent Cattleman's Association, & a perennial winner of newspaper & magazine reader polls, Manny's commands a fanatical local following & a national reputation. Wrote the New York Times: "There's good news in Minneapolis for those who still share the secret pleasures of red meat, well-cut & seriously served." In addition to USDA-certified, dry- aged, center-cut beef, Manny's offers chops, chicken, fresh seafood & a Wine Spectator Award-winning wine list.